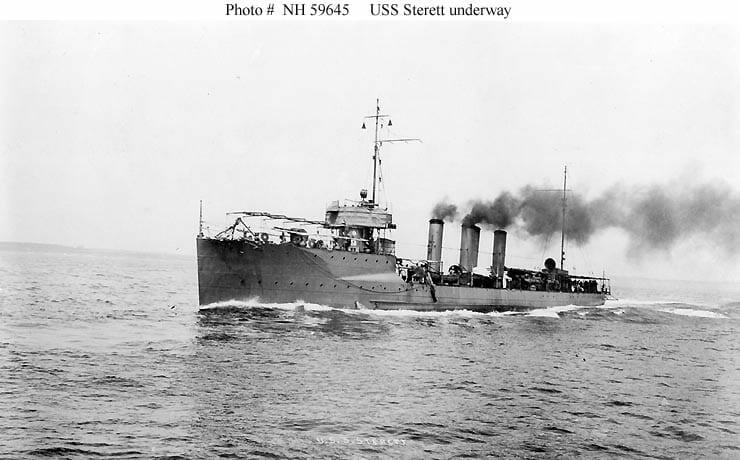 The first USS Sterett was a three stack, modified Paulding class destroyer, often referred to as “flivvers”. She was 293 feet long with a 26-foot beam and 16-foot draft. DD-27 displaced 742 tons. Her oil-fired 12,000 shp (shaft horsepower) power plant consisted of four boilers driving twin screws via steam turbines. DD-27 had a top speed of 29.5 knots and carried a crew of four officers and 82 enlisted men. DD-27 was armed with five three-inch guns, three .50 caliber machine guns and six 18-inch torpedo tubes. Her distinctive three funnels distinguished her from the rest of the four funnel destroyers of the time. Builder: Fore River Shipbuilding Company, Quincy, MA. LTJG Harry Booth Hird? 1913-? Story in the 10 May 1910 Quincy Daily Ledger – Two days prior. Preparations for the launch of the torpedo boat destroyer Sterett at the Fore River shipyard Thursday morning are practically completed. The vessel will be launched at 11:30, and will be christened by Dorothy Rosallie Gittings of Baltimore, a daughter of a prominent banker of that city, and a direct descendent of Commodore Sterett, for whom the vessel is named. Miss Gittings and the Baltimore party will make their headquarters at the Vendome. (hotel in Boston). Thursday morning they will come to the Fore River on a special train that will leave South Station at 10 o’clock. This train will be run directly to the Fore River yards. Immediate after the launch, a lunch will be served in the mold loft where there will be some speaking. The Sterett is the sister ship of the Perkins launched last month. She is 293feet, 10″ inches overall and 26feet 4″ inches moulded breadth. Her battery will consist of five 3-inch guns, three 45 c-m torpedo tubes on deck and two .30 caliber automatic guns. 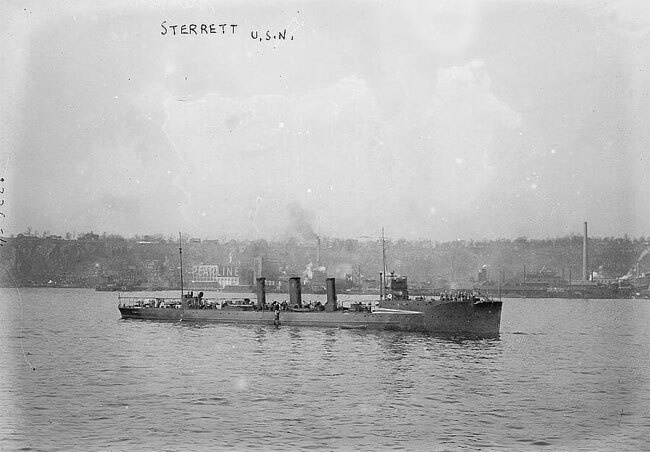 The Sterett, like her sister ship, is notable in being the pioneer of a new enlarged type of ocean going destroyers capable of keeping at sea with the battle fleet, and it is interesting to note that since these vessels were designed, the first class naval powers have followed suit in laying down vessels of similar type. Her motive power will be two Cur-reversible marine turbines, capable of of developing 6,000 horse power each, at about 600 revolutions, and will give the vessel a speed of 29.5 knots per hour. The vessel is flush decked, fore and aft, with a top gal’ant forecastle, giving a high platform for the forward gun with a good height for conning tower and steering station, while contributing to the seagoing qualities of the ship. The captain’s and officers’ staterooms, wardrooms, and conveniences are arranged in the forecastle while the berth deck immediately below these are quarters for part of the petty officers and crew, the remainder being berthed aft. Miss Gittings, who is a direct descendent of Commodore Sterett, arrived in Boston from Baltimore on Wednesday and registered at the Vendome. She was accompanied by her father. Suspended from her bow was a long tri-colored ribbon at the end of which was a bottle of Mumm’s extra dry, with which the vessel was to be given her name. This bottle of wine was encased in a silver mesh so that the glass would not fly when broken. All was now in readiness. Nothing remained but to saw away the two soul pieces, the last links that held the destroyer on the ways. With a hasty glance to see that all was in readiness the signal was given and a minute later the saws had made their way through the planking and with a cracking sound the vessel began to move. This was a signal for the crowd on the launching stand and in the yards to cheer, which was taken up by the whistles in the yard and craft on the river, while the hundreds gathered on the shore of the river also cheered as, with a splash, the Sterett entered the water. Tugs immediately came alongside and took her to the fitting out dock to a berth alongside her sister ship “Perkins” where she will be completed. 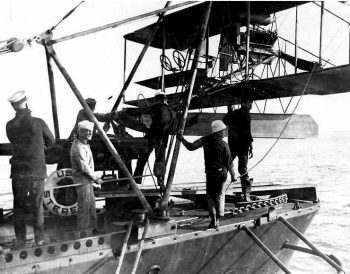 Each year until 1913, Sterett operated along the east coast out of Boston from April to December and, from January to April, participated in training and battle exercises out of Guantanamo Bay, Cuba. Though placed in reserve on 5 November 1913, she continued duty with the torpedo fleet. On 20 January 1914, she sailed from Charleston, South Carolina, and reached New Orleans, Louisiana on 2 March, after stops at Cape Canaveral, Miami, Key West, Florida, and at Mobile, Alabama. The following day, she joined the newly created Reserve Torpedo Flotilla, operating in the Gulf of Mexico out of Galveston, Texas. In June, she returned to the Atlantic seaboard, this time based at Norfolk, Virginia, and resumed coastal patrols and Caribbean exercises. Sterett’s complement was reduced on 5 January 1916 and, throughout that spring; she operated almost exclusively in the Caribbean. On 1 June, she was a part of the fleet which landed and supported the Marines at Monte Cristi, Dominican Republic, and marched to Santiago to restore order and to protect lives and property. Soon thereafter, Sterett returned to Norfolk and resumed operations along the east coast. On 1 January 1917, she entered the Mississippi, stopped at New Orleans, and steamed up river to Vicksburg, Mississippi. She reentered the gulf and patrolled the Texas coast until she was shifted to Key West on 18 March. From there, the destroyer ranged as far as the Cuban coast. In April 1917, the United States entered World War I, and by 9 June, Sterett was in Queenstown, Ireland. Throughout the remainder of the war, she operated from Queenstown to meet convoys and conduct them to either Berehaven, Ireland, or to Devonport, England. At these points, British and French destroyers assumed responsibility for the last leg of the voyage. 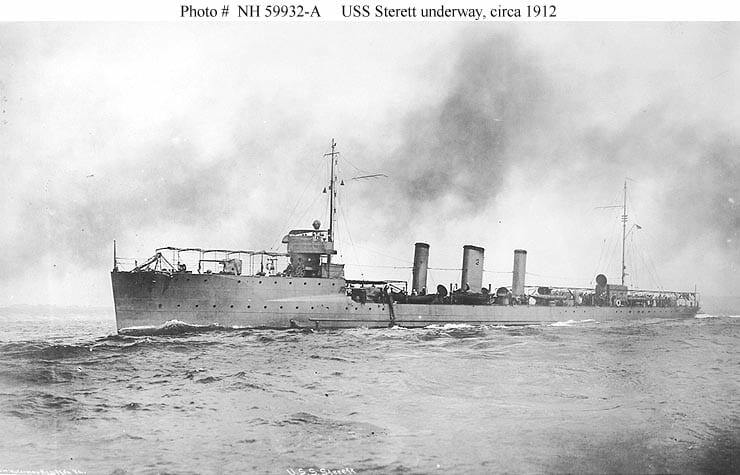 A little less than a year after her arrival at Queenstown, on 31 May 1918, Sterett was herding a convoy toward the rendezvous point when she came upon a surfaced U-boat. As Sterett closed, the submarine rapidly submerged. Sterett began dropping depth charges furiously, and air bubbles and oil soon appeared on the surface, indicating damage to the German raider. After exhausting her supply of depth charges, Sterett pursued the enemy by the U-boat’s wake of bubbles and trail of oil, hoping to force her to exhaust her batteries and air supply. She continued the pursuit through the night, guided in the darkness only by the fumes of the sub’s leaking oil. Finally, at dawn, the destroyer’s persistence was rewarded. She sighted the U-boat on the surface about 1,000 yd (910 m) ahead. Sterett sliced through the waves at top speed seeking to ram the submarine, but the U-boat countered by swinging hard to port. Sterett passed within 20 ft (6.1 m) of the submarine and, as the U-boat attempted to dive, brought her guns to bear. However, without sufficient time to bracket their adversary, Sterett’s gunners watched helplessly as the submarine slid beneath the surface and escaped. For their dogged determination, the officers and men of Sterett received the commendation of the Commander-in-Chief, Coast of Ireland. The year 1918 brought with it an all-out effort on the part of the Central Powers to bring the war to a successful conclusion. The German Navy increased the intensity of its submarine operations in order to free Germany from the Allies’ ever-tightening blockade. In response to this thrust, Sterett maintained a grueling schedule of convoy duty-a week or more at sea followed by a day or two in port. One of her new techniques, the use of airborne surveillance, presaged modern hunter-killer antisubmarine warfare. The Allies prevailed, however, and the Armistice, signed on 11 November, brought an end to Sterett’s strenuous duty; and, by 3 January 1919, she was back in the United States at Charleston. From there, she moved to Philadelphia, Pennsylvania where she was decommissioned on 9 December. On 9 March 1935, after a little more than 15 years of inactivity, Sterett was struck from the Naval Vessel Register. On 28 June, she was sold for scrapping to M. Black and Company of Norfolk, Virginia.